From its humble beginning as a railroad stop along the Hannibal & St. Joseph railroad, the community of Lathrop, Missouri has benefited from a unique and rich history. During its extensive timeline, the community of Lathrop has witnessed many distinctive accomplishments, some of which are known worldwide. In 1866-67, the Hannibal and St. Joseph railroad decided to build a station along the developing Kansas City railroad branch south from Cameron, Missouri. The area, now known as Lathrop, MO, was chosen due to the abundance of fresh water springs, which was needed by locomotive steam engines. Lathrop, which was named in honor of the treasurer of the Hannibal and St. Joseph Railroad Company, was laid out and platted in 1867. Shortly thereafter, another railroad line was constructed, allowing a connection to the main line of the Santa Fe. The Hannibal and St. Joseph Railroad Company later merged with the Burlington Northern line and served the community until 1962, when the branch was discontinued. 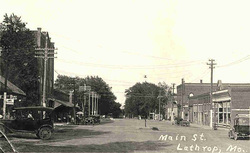 Lathrop was first organized on February 2, 1869. The first Board of Trustees consisted of James M. Young, John O. Daniels, George A. Patch, David E. Main as president, Lamar W. Lee as clerk, and H. C. Murdock as treasurer. They served until April 1881, when Lathrop was chartered as a Fourth Class city. Lathrop’s first mayor was A. J. Orem. The first school was established as early as 1868. The school was formed in a blacksmith shop and consisted of about twenty pupils. A public school was soon instituted and a grade school building was later constructed in 1871, which was the first brick building erected in Lathrop. The first municipal water distribution system was completed in 1924. Access to major railroads attracted two businessmen, Mr. Guyton and Mr. Harrington. Guyton and Harrington operated a horse and mule farm, which began operations in Lathrop in 1891. This internationally known horse and mule dealer maintained its principal point of operations in Lathrop. The company’s main branch in Lathrop generated 300 jobs; by far the early community’s largest employer. Guyton and Harrington’s business in Lathrop consisted of 20 “stations”. The stations were made up of different facilities and operations, such as barns, offices, stables, washing barns, and loading pens and chutes. At one time, Lathrop was known to be home to the largest pack mule production farm in existence, earning the community’s nickname, “Mule Capitol of the World.” During the Boer War in 1901- 02, approximately 170,000 mules where handled by Guyton and Harrington. Almost all of these mules where shipped from the Lathrop location over seas to their final destination in South Africa during the Boer War. Another 90,000 where sold during World War I. It is reported that there were days during peak mule demand when up to 100 trains went through Lathrop. The facilities in Lathrop were able to feed and support 17,000 mules at a time, featuring barns as large as 65,520 square feet. Trains coming into Lathrop not only delivered and received mules, but also brought in grain and hay for feeding the massive number of mules on hand. The large number of trains would often tie up the tracks for miles. At times, switch tracks where backed up as far as Leavenworth, Kansas, a distance of over fifty miles. Lathrop’s historical economy, however, is not limited to the mule trade. In addition to numerous secondary and tertiary businesses developed as a result of Guyton and Harrington, other employers also chose to locate in Lathrop, including the Midwest’s largest sunbonnet factory in 1899. The bonnet factory was open eight to nine months a year and produced about 500 bonnets a day. Lathrop Bottling Works was established in 1912 and bottled eight flavors of soft drinks. They were one of the first bottlers in the region to bottle Coca-Cola. A few other historic businesses included The Lathrop Bank (est. 1879), a lumber yard owned by J. O. Daniels (the first settler in Lathrop), the Robison Elevator, and Grant’s Grocery. Lathrop today has grown to a population over 2,000 individuals. At the present date there are three schools in Lathrop, with a new high school currently under development. Lathrop has seen relatively slow, but constant growth in population over the last seven decades. Being located less than forty miles from Kansas City, it is expected that Lathrop will continue to see an increase in size and economy.